Don't have time to hit the gym or work out with a personal trainer? An internet connection might help you lose those pounds or pump up those muscles -- without even leaving the house. No, this isn't one of those ads for a magic weight-loss pill. Services like Wello let you to work out with a personal trainer, using just a webcam and your web browser. It works kind of like Microsoft's (MSFT) Skype or a Google (GOOG) Hangout, but everything is done through Wello's website, and there's no need to download any software. Just log on and find a trainer that suits your needs: yoga, pilates, aerobics and strength training are some of the categories. Roll out your yoga mat in your living room, kitchen or backyard and start your class. Group classes cost $14 and one-on-one sessions with a trainer are $29. Maria Kinglsey is teacher in New York who found it inconvenient to fit the gym into her busy schedule. Now, she does one-hour workouts from her Manhattan living room through Wello, even though the trainer behind the webcam can be on the other side of the country. "It's just really functional, useful and convenient for busy people," Kinglsey told CNN. Some apps can also serve as a virtual trainer. A company called Passion4Profession has a particularly good abdominal muscles exercise routine. Hit the floor, prop your cell phone or tablet on the mat and the app takes you through a series of eight abs exercises in eight minutes. The app is free to download, as is the first level. After that you have to watch a short ad before the session begins. The app counts you through each crunch and registers each set you complete. It even builds in rest time so you can catch your breath. Another company, Runtastic, offers a fleet of workout apps, including a free app to track your push ups. Get in position and set your phone on the ground face up. 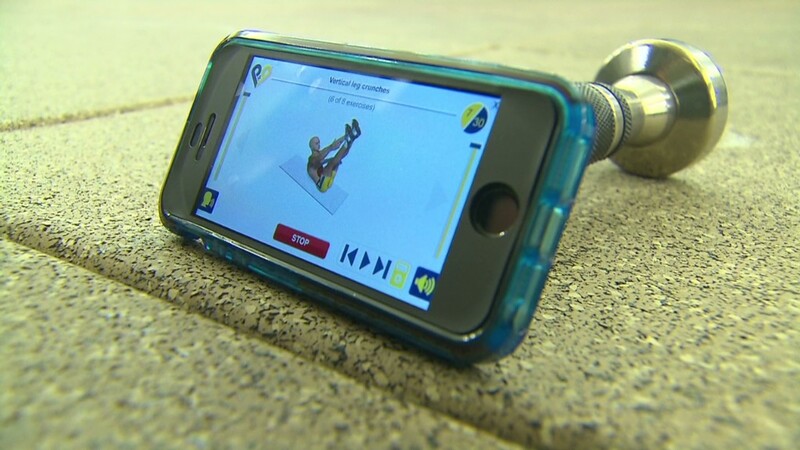 The app counts pushups when your nose touches the screen of the phone. That way it makes you go the way down. No cheating. Some of these apps say to consult a doctor before you use them. Dr. Tara Narula, a cardiologist at Lenox Hill hospital in New York, says that may not be necessary for everyone. "If you're beginning a low to more moderate exercise and you're a relatively healthy person, then you don't really need to see a doctor and have a stress test," she says. "If you have a heart disease or history of other risk factors and you're planning to do a moderate or vigorous exercise, then see your doctor for an evaluation first." But with more than one-third of the entire world overweight she says trying out these new tech approaches to exercise and weight control are worthwhile. "They really make it easier for people to work out and that's ultimately what we want: people to find ways to incorporate working out and exercise into their daily lifestyle and routine so it becomes habit."